Golf Carts are becoming an increasingly popular method of transport both on and off the golf course. With the rise in popularity in electric vehicles, consumers are turning to golf cars as an alternative and less expensive method of transportation. Stay up-to-date with the latest news from around the globe by visiting the All Electric Vehicles website today. Gas and electric golf carts might look the same, but they have a single, massive difference between them: how they’re powered. Whether you’re buying golf carts for your resort, university, or amusement park, this difference is what you have to spend some time considering. So when it comes to gas versus electric golf cart, which is the better option? That’s what we’re going to help you figure out. 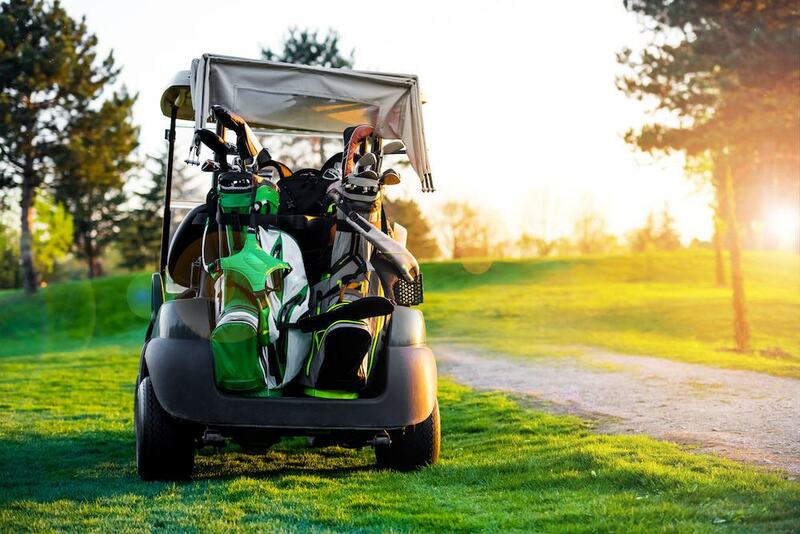 In this article, we break down the difference between gas and electric golf carts and the risks and benefits that come along with them. Gas Versus Electric Golf Cart: What’s the Difference? 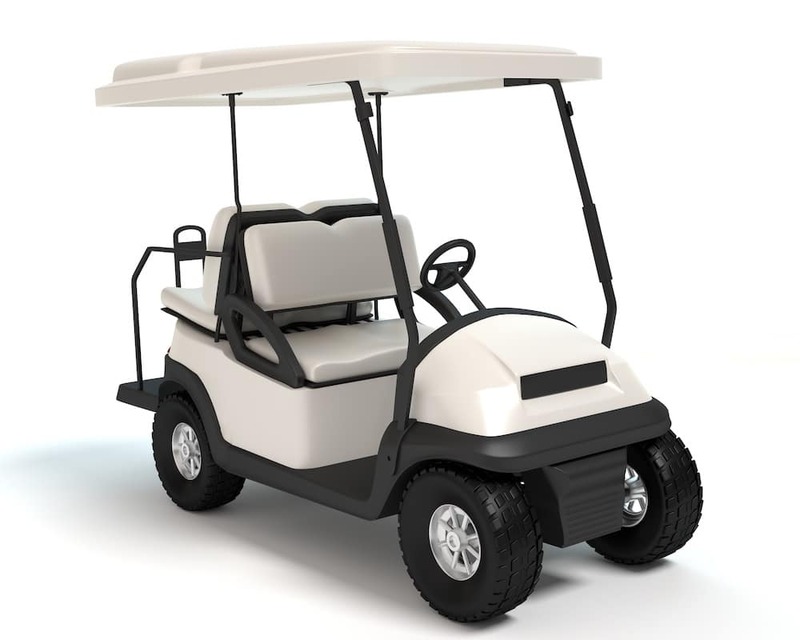 When you buy golf carts for your businesses, you can either choose electrical golf carts or gas golf carts. You might have heard that gas golf carts are traditionally more durable and powerful than electric golf carts; which is not correct. And even if it was, gas golf carts fall far below electric golf carts when it comes to the most crucial consideration: safety. Gas golf carts can be much more dangerous than electric golf carts, and we’re going to show you why. But first, let’s take a closer look at the difference between gas and electric golf carts. Electric golf carts don’t run off any gas or fuel. Instead, they get their power from a 36 or 48-volt battery. To keep the golf cart running, all you have to do is recharge the battery after using it. These golf carts don’t create any pollution, so they’re an entirely green option. Unlike electrical golf carts, petrol golf carts use combustion engines that require petrol – the same type you pump into your car. Because of this, petrol golf carts emit carbon monoxide, which can be harmful to both the environment and people. You create carbon monoxide any time you burn fuel in a fireplace, stove, furnace, lantern, or car. Because your golf cart also burns fuel, it creates carbon monoxide as well. The carbon monoxide that comes from your golf cart can be dangerous in several ways. Aside from pollution, this gas can poison you and lead to long-term health conditions. Let’s take a closer look at each of those carbon monoxide effects below. When a gas golf cart creates carbon monoxide, the gas gets into the environment and contributes to pollution. How does this pollution work? When the carbon monoxide emits from the golf cart, it reacts with other types of pollutants already in the air creating a layer of ozone close to the ground. The good news is the level of carbon monoxide in the air in most places is small-not harmful to people or the environment. However, some of the major cities in Australia have much higher levels of carbon monoxide. The carbon monoxide in these areas can be potentially harmful. Anyone who breathes too much carbon monoxide can suffer from carbon monoxide poisoning. Carbon monoxide poisoning is much more likely to happen indoors. If you were to run a gas golf cart for too long inside an enclosed area, like a garage, carbon monoxide gas would start to build up inside the space. Because you can’t see or smell this gas, you wouldn’t even know it’s happening. High levels of carbon monoxide can even cause unconsciousness. If left alone, carbon monoxide can result in death. People who have suffered carbon monoxide poisoning are at risk of developing long-term health conditions as well. Exposure to this toxic gas increases a person’s risk of getting heart disease, which is one of the leading causes of death in Australia every year. Some studies suggest carbon monoxide also results in babies being born with lower birth weights. Anyone who lives through carbon monoxide poisoning can experience other health complications throughout the rest of their life. Who’s at Risk of Carbon Monoxide Poisoning? Carbon monoxide poisoning can affect anyone. It doesn’t matter how old or young the person is. If there is carbon monoxide in the air, anyone who breathes it is at risk of poisoning. Is Carbon Monoxide Worth the Risk? Not every gas golf cart emits enough carbon monoxide in the right circumstances to poison someone. But every gas golf cart has the risk of poisoning someone. Is that risk worth it? When you compare gas golf carts to electric golf carts, we would say no. Electric golf carts can do everything a gas golf cart can do, and they are much safer for passengers and the environment. You might have heard gas golf carts are faster or more durable than electric golf carts. While this may have been the case in the past, the differences between the two are not as noticeable anymore. On top of that, electric golf carts come with a lot of added benefits gas golf carts don’t have. Let’s take a look at some of the best benefits below. The durability of a golf cart doesn’t depend on whether it’s a gas or electric cart. It depends on the make and model. Sure, some electric golf cart’s might not be as durable as gas golf carts. But those are mostly older carts. Most electrical golf carts are just as durable as their gas counterparts. Low emissions are one of the most important benefits of an electric golf cart. They don’t create any pollution. Zero emissions make them safe to drive anywhere, both indoor and outdoor. They’re also a good option for businesses who want to have a positive impact on the environment. Gas golf carts make a lot of noise. Because they have combustion engines, there’s no way to muffle the sound they make when they’re running completely. For some businesses, they can’t tolerate this amount of noise. Electric golf carts don’t make much of a sound when someone drives them, even if they’re accelerating or going up a hill. So drivers can go wherever they want without letting everyone in the area know where they are. Contrary to what you might have heard, electric golf carts don’t have trouble going up hills. They have the same amount of power petrol golf carts have. The only reason an electric golf cart will start to slow down is if the battery is running out of charge. And that’s a temporary problem. All you have to do is recharge it. Gas golf carts need the same type of maintenance you would give your car. That includes things like oil changes, spark plug replacements, and starter belt repair. Your business either has to know how to do all these things or have the ability to pay for another company to do this maintenance. The amount of fuel gas golf carts require can also get expensive fast, especially if you have multiple carts. The only maintenance you have to do on your electric golf cart is charge the batteries. Make sure you charge them after every use for the best results. Once the cart starts getting old, you may need to replace the batteries as well. But you don’t need to worry about this for at least five years after you purchase the cart. Maintaining an electric golf cart is much easier and cheaper than a petrol golf cart. Electric golf carts eliminate the risk of carbon monoxide poisoning. Because of this, they’re a safer option for your business (no matter what it is) and your passengers. Picking a golf cart isn’t just about getting one that can do what you need. It’s also about safety. Carbon monoxide pollution and poisoning is a genuine risk with gas golf carts. You have to ask yourself if the benefits are worth the risk. In most situations, the threat of carbon monoxide isn’t worth it. So when it comes to petrol versus an electric golf cart, choosing the electric cart is often the better option. Are you looking for electric golf carts for your business? Make sure you check out some of the carts we have available! Golfing is about enjoying the outdoors, relaxing, and focusing your attention on the game. When you also notice yourself worrying about your golf cart holding up and start seeing wear or tear it can take away from all of the fun. Having the right golf cart accessories can make some of the hassles of golfing go away! There are plenty of ways to accessorise your golf cart to make it your own, but how can you decide which ones are the best for your needs? 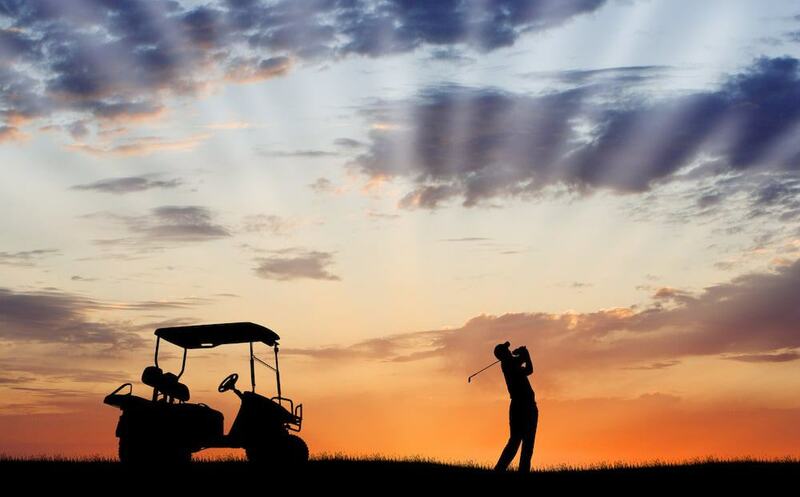 If you are interested in getting your golf cart in shape and up to your standards, keep reading to find out which accessories can help you have the best golfing time yet. These are a great accessory that increases your safety while you are on the golf cart. Many of the golf cart mirrors you can purchase are easy to install as well, so you don’t have to spend too much time figuring out how they work. Be sure to attach them with high-quality screws to ensure they stay put! If you are interested in mirrors that fold in, you can get some that will store this way to protect the mirrors while you are not using the golf cart. There are also mirrors that come in square, rectangle, oval, or circle shapes and this helps you have even more choice with this accessory. Lastly, a great option to add in addition to the side mirrors is some anti-fog film or spray that will prevent the mirrors from fogging over in inclement weather. Getting a cover for your golf cart is pretty self-explanatory. It is a great way to protect the golf cart from everything out there, like bad weather, birds, or even too much sun. A lot of these things will cause the golf cart to age faster and can be damaging over time. The golf cart cover is beneficial for the people that are in the golf cart as well because they get protection from these things too! You can get covers that are soft or hard materials, depending on your preference. In addition to this, if you want a cover that is used only for storage, these are available as well to protect your cart even further. Typically, these are going to cover the entire thing from top to bottom, including the tyres and rims. Wing flares have a lot of uses, but one of the reasons they are great for golf carts is that they can help prevent mud from coming up onto passengers or up into the inside of the cart. These sit right above the tyres and can be made from a variety of materials, so be sure to consider this when you are choosing the type that will best protect you. In addition to this, wing flares can help prevent rusting around the wheels, help accommodate larger tyres, or add some extra style. Wing flares are a great addition because they are functional, but also can help make your ride more comfortable in messy areas. A windscreen is excellent because it protects your face from whatever may fly at it while you’re driving! Think of it as just another safety feature you can use to customise your golf cart. Some windscreens can be removed and put back on in a moment’s notice while others may be attached to the actual frame. Depending on what your needs are, be sure to decide which type of windscreen is the one for you before making a purchase! Just like with your car, truck, or SUV, your golf cart needs new tyres as well! You’ll have to change them regularly and can update them if you want to. Golf cart tyres can come in a lot of different styles and have different types of rims, such as chrome or aluminium, and you will want to consider which is the best for your golf cart uses. You can get particular with this part of your cart. You also want to consider the size of the tyre. Bigger tyres may require you to lift the body of your golf cart to ensure they fit. Not all golf carts can support larger tyres, so make sure that you are choosing a size that is safe for your cart. Golf seat covers can make your ride more comfortable, but they can also help the seats be more durable overall. There are plenty of different seat cover options out there in terms of colours, patterns, materials, and more that will help you get the perfect feel for your seats. There are even covers for the golf cart seats that have heaters built into them, so you can still enjoy the comfort of your seats while it gets a little bit colder outside. For those of us that enjoy golfing well into the fall months, these can be a lifesaver! Most standard golf carts don’t have a lot in the way of storage. Some of the things that people like to have, such as cup holders or small pockets near the seats, are usually not included but, you can easily add them! Golfers tend to like to bring things with them that will help with their game, such as scorecards, rangefinders, or even umbrellas. Without a place to put them, it can be a bit of a hassle to find a spot where they won’t fall or get lost. There are plenty of attachments that you can get that are both big and small. For instance, a lot of golfers like to put a large compartment in the back to keep their golf bags. When you have a lot of guests on the golf course, you want to make sure that they have somewhere to sit. Rather than have more storage in the back, some people opt to put in another row of seats for people that want to sit in the back. If you would like this added to your golf cart, you want to be certain it is secure before allowing someone to sit back there. After all, it can be dangerous for you to drive around if the seat might fall off at any moment. Rear seats are popular in golf carts, and since most people like to golf with buddies, they can be an accessory that gets plenty of use. Who doesn’t want to enjoy a cold beverage while golfing? One of the accessories that you can add is a cooler that can sit either on the side, in the centre, or off the back of the golf cart. If you know, you’ll be wanting some cold drinks while out in the hot sun, an attached cooler for your golf cart may be the perfect solution. Lights are important for any vehicle, including a golf cart, because they help you be able to see in the dark, be seen at night, and increase the safety of the vehicle itself. The lights you choose can set your golf cart apart. A light kit has everything you need in terms of making these goals happen! A light kit is handy because it will help you add all of the lights you need to either spruce up your ride just enough for your tastes or even make the golf cart street legal. The beauty of light kits is that everything you need for installation is included. After you choose whether or not your ride needs to be legal to drive in the street, you also want to consider the type of lightbulbs you wish to use. The most common types of lights you may have are halogen or LED lights, but other options can be found as well for your golf cart. Ready to Accessorise Your Cart? Choosing to get some golf cart accessories for your cart can be something that sets your golf game above the rest! There are so many options to choose from that you will be able to customise the look of your cart. If you are interested in seeing how tricked out golf carts can help with your game, be sure to check out our blog post about golf carts that feature these accessories. Golf carts aren’t limited to the golf course anymore. People have started driving these vehicles on college campuses, gated communities, retirement homes, private property, parks, and hiking trails. These carts have even found their way onto public roads. But why do people like driving golf carts so much? Well, there are a few reasons. Golf carts are leisure vehicles. And if you have a leisure vehicle, you may as well drive it any chance you have. Golf carts also drive at a low speed. Many golf carts can’t go over 15 MPH, and “fast” golf carts don’t reach speeds higher than 25 MPH. Because of these low speeds, many people believe that people of all ages can safely drive golf carts. What these people don’t realise is that “children’s golf carts” aren’t always as safe as they seem. Should Children Drive Golf Carts? Children should NEVER drive any golf cart on their own, especially without supervision. Kids don’t have the right judgment and motor skills needed to operate a vehicle, even a slow one. Giving a child permission to drive a golf cart can result in serious injury. Golf carts aren’t like bikes. They don’t make good toys. While it might not look like a car, you should always treat a golf cart like a car. No one under the age of sixteen should ever get behind the wheel of any motor vehicle, and that includes a golf cart. What Kind of Injuries Result from Golf Cart Accidents? The number of golf cart-related injuries has gone up in the last several years. Many of these injuries ranged from moderate to severe. The injuries were worse in older children. So people who think allowing their older kids drive golf carts is a perfectly safe idea are mistaken. Golf carts don’t have doors or sides like traditional cars. Because of this, the most common cause of injury was getting thrown from the cart. Another common cause of injury was overturning the cart altogether. These accidents can cause damage to the spine, neck, and brain. Golf cart-related injuries can be severe and may require treatment in intensive care. So if you let your kid behind the wheel of a golf cart, be prepared to take an expensive trip to the emergency room. Why Are Golf Cart Injuries So Common for Children? Golf carts don’t have the same safety measures as other forms of transportation. For example, traditional cars have seatbelts. When kids ride their bikes, they wear helmets. They don’t have to do any of these things when they drive a golf cart. Neither seatbelts or helmets are required. While golf carts can pose a serious safety concern for children, they don’t have to. If you follow the right safety tips, you and your entire family can enjoy a drive around the neighbourhood. Here’s a quick list of safety measures you should follow every time you get into your golf cart. Once you purchase a golf cart, you have to maintain it, so the cart stays in good condition. That maintenance should include the following things. You should always make sure the tires are full, and the oil is clean. If you have an electric golf cart, charge the battery often. If you have a gas golf cart, keep an extra bottle of fuel on hand. You’ll also want to check the oil tank for leaks and ensure the brakes are in working order at least once a year. Some golf car owners modify their golf carts to increase their maximum speed. If safety is your main concern, don’t make any additional changes to your cart. Faster speeds can make potential injuries worse. All drivers should be over the age of 16. Don’t let younger children drive the golf cart under any circumstances. Golf carts might be slower than cars, but you should treat them with the same respect. Here are a few things to keep in mind when you’re driving your cart. You should always press the brakes slowly. Gradually depressing the brake pedal is even more critical when you’re going downhill. If you slam on the breaks, you might get thrown from the vehicle. Sharp turns present the risk of overturning your golf cart. Drive at a slow speed around all turns. You should wear seatbelts whenever possible. While this may not be required in parks or private property, driving unbuckled on public streets is illegal. It’s a good idea to keep your golf cart at a slow speed whenever you’re driving it. But it’s even more important to drive slow in bad weather. Just like any other vehicle, you should stay out of your golf cart if you’ve been drinking. Golf cart accidents can be even more dangerous for younger children. To ensure everyone’s safety, don’t let anyone under the age of six onto your golf cart. To stay safe during a golf cart ride, passengers should sit still and remain calm. Unruly behaviour could cause a passenger to fall out and get hurt. Here’s a quick look at how passengers should sit in a golf cart while it’s driving. All passengers should wait for the golf cart to stop before exiting the vehicle completely. Children’s Golf Carts: Should Kids Drive? Children’s golf carts might seem like safe vehicles for your kids to drive around the park, but the carts slow speed can be deceiving. 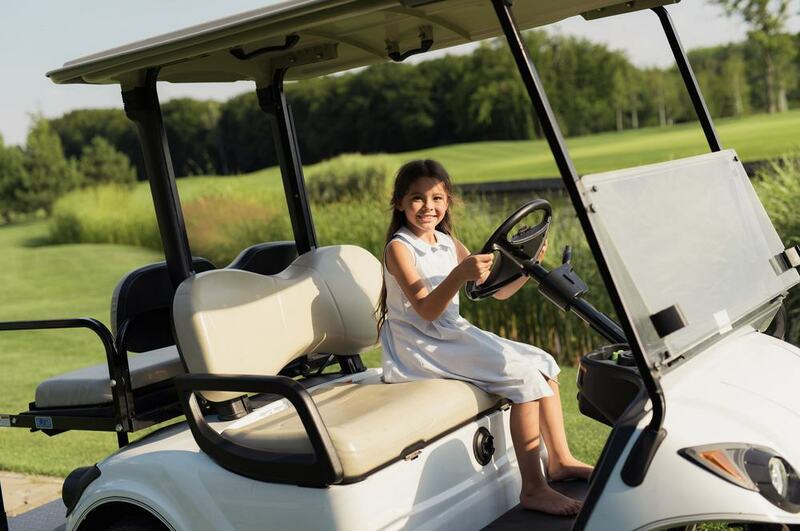 Young kids can get sustain severe injuries from golf cart accidents. No one under the age of 16 should get behind the wheel of a golf cart. Ready to buy your golf cart now that you know these safety tips? Take a look at some of our options. Golf cart injuries are increasing, rising 132 per cent since the 1990s. The most common cause of golf cart injury? Falling or jumping from the gold cart. Don’t become part of the statistic. Golf carts are convenient and fun to drive, but little people consider the dangers that come along with them. Follow these ten golf cart safety tips to prevent any risks. Just like when riding on a roller coaster, all body parts should remain in the golf cart while in motion. You or your passengers should never stick an arm out or drag a foot below the cart. Golf carts are unstable, and this little bit of weight can cause them to tip. You could mess up your balance and fall entirely out of the cart. And you never know what a body part could hit if you let it stray outside the cart. Even though golf carts don’t travel at top-speeds, any of these incidents could cause extreme injury. Play it safe and stay entirely inside the cart. Just like a regular vehicle, you should never drink and drive a golf cart. All of these symptoms can quickly become deadly when paired with a motor vehicle. Save yourself the trouble and always walk, call a taxi, or carpool if you have been drinking. You may think that since a golf cart is smaller than a standard vehicle, it’s okay to drink and drive. But it’s not! Drinking and driving are not only dangerous to yourself, but it’s also hazardous to your passengers and pedestrians. Golf carts come with a maximum capacity for a reason. You should never attempt to fit more people on a golf car than it is made to handle. A general rule is that every passenger should have their seat inside the golf cart. Never allow passengers to sit on laps or hang off the side or back of the cart. Overcrowding your golf cart makes it easier for passengers to fall off or get injured. Adding more weight puts more strain on the golf cart, making driving dangerous. Distracted driving is dangerous driving. When you get behind the wheel of any vehicle, your concentration should remain on driving. The Road Safety Commission lists texting while driving as the most common form of distracted driving. But any activity on your phone, such as answering a call or using a navigation system, is distracting. Distracted driving also covers eating while driving, adjusting vehicle controls and music, or loud passengers. Seatbelts are one of the first golf cart safety tips. While most golf carts don’t come standard with belts, it’s an accessory you shouldn’t go without. Seatbelts help make sure that everyone remains inside the golf car. And when everyone remains inside the cart, they are less likely to be injured. Not wearing a seatbelt is the leading cause of death in motor vehicle accidents. If you don’t wear a seatbelt, you’re eight times more likely to be killed in a crash. Proper golf cart training will teach you that hand signals are your best friend. Left-hand turn – Your left arm straight out the left side of the golf cart. Right-hand turn – Your left arm out the left side of the golf cart, but pointed upwards at the elbow. Stopping – Your left arm out the left side of the golf cart, but pointed downwards at the elbow. Even if your golf cart comes with brake and signal lights, you should also use hand signals. Golf carts aren’t racing carts. You should never drive your golf cart at its maximum speed. Keep your golf cart speeds to a minimum for everyone’s safety. Also, avoid sharp or sudden turns. 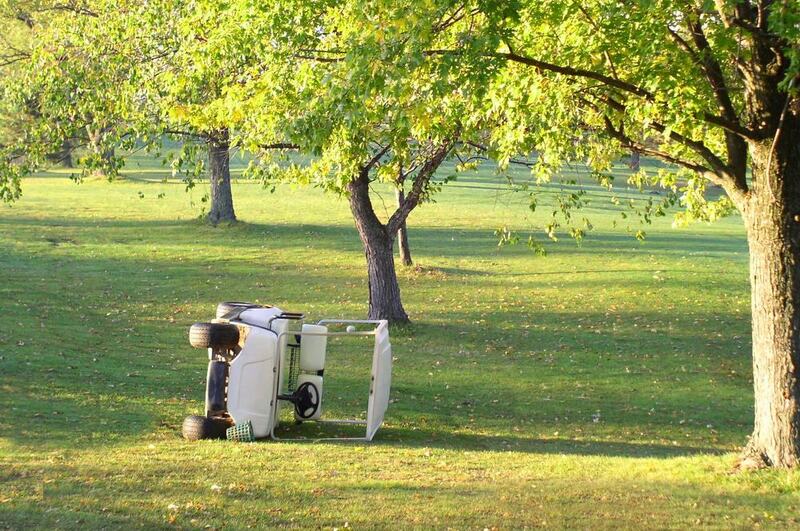 An unexpected turn in a golf cart can lead to your cart tipping over or a passenger falling out. Always slow down for corners and take them carefully. These rules are especially important when driving on hills or turning on blind corners. A class C drivers license is required to operate a golf cart. Therefore you should never let children or unlicensed drivers operate your golf cart. If you have a license but are under 16 years of age, you need to have the supervision of a fully-licensed driver. Anyone licensed over the age of 18 can drive a golf cart unsupervised. Golf carts are designed to operate on golf courses in fair weather conditions. Golf Carts with split acrylic windshields provide abysmal visibility during wet weather. Rain covers can distort your peripheral vision causing you to think you’re about to run into a tree that isn’t there. Avoid driving your golf cart in the snow or during heavy rains. Golf carts aren’t made to handle adverse weather conditions. And since most golf carts aren’t enclosed, you won’t want to be driving in cold or bad weather anyways. No matter if you’re using your golf cart on the course or driving it around the neighbourhood, you need regular maintenance. It’s best to have a qualified professional service your golf cart regularly. You should always set up an appointment before using your cart for the first time in a while. While driving your golf cart, pay attention to how the cart is driving and handling. Never drive a golf cart that is running differently than usual. Now that you know all about golf cart safety, you’re ready to purchase your own. Golf carts are a significant investment and can fit with every lifestyle. Are you wondering what other uses a golf cart has? Check out this article on non-golf reasons for buying a golf cart. Ready to purchase your golf cart? View our large selection of golf carts online. If you think that golf carts are just for avid golfers, you’re not alone. It makes sense that so many people think golf carts are only for golf; after all, it’s in the name, right? However, you might discover that a golf cart could come in handy even if you don’t live in a country club. There are a lot of non-golf reasons for people to buy golf carts. Some dealerships in the United States have reported that 40% of their sales are now for non-golf purposes. So if they’re not going golfing, why are people buying a golf cart? We’ve rounded up the top six reasons right here. Read on to learn more. If you often only drive short distances and want to reduce your carbon footprint, you might want to consider a golf cart as your next purchase. The petrol-powered golf carts get fantastic mileage, especially when you compare them to large SUVs that guzzle petrol. 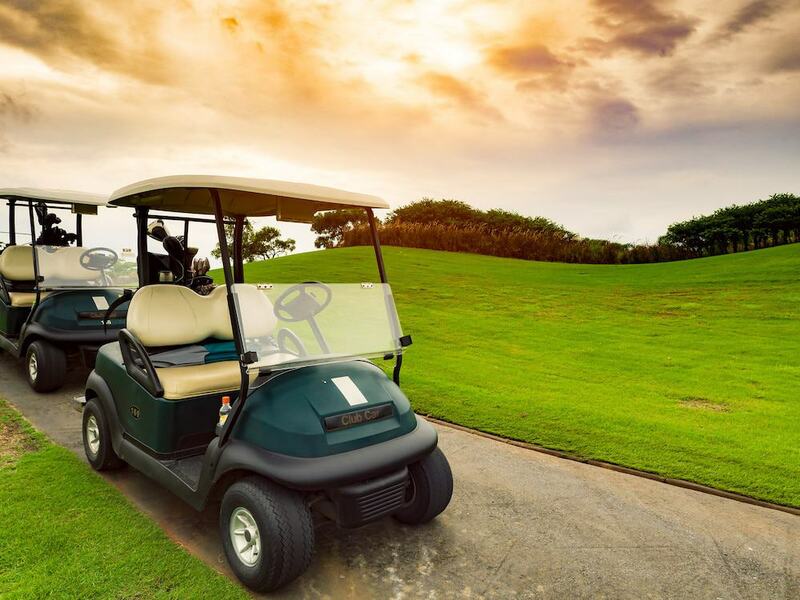 If you enjoy driving around to see the scenery and don’t want the guilt that comes with it, buying a golf cart could be an excellent choice for you. If you want to be extra conscientious, you can even find battery-powered golf carts instead. Some people avoid this because they’re afraid of how often they would need to charge their cart, but this is rarely an issue. 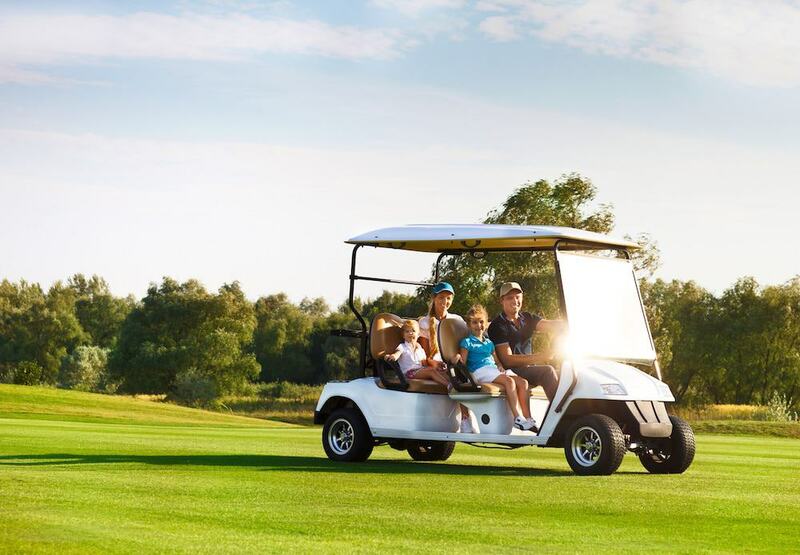 Most battery-powered golf carts can go up to thirty kilometres before they require charging. When you’re only travelling short distances, this shouldn’t be much of an issue. Speaking of short distances — have you considered a golf cart for getting around your neighbourhood? We’ve all had a moment where a neighbour invited us over in the evening, and we decided to drive rather than walk, even though it wasn’t that far away. Sometimes that might also come with a little guilt, especially if you’re trying to be healthier or environmentally conscious. Golf carts are a perfect option for just getting around your neighbourhood. They don’t take up a lot of space on the road, and they’re easy to drive. Does your business occupy a sizeable parcel of land? Are you always making trips back and forth to transport materials or even people? You might want to consider buying a golf cart for work. A lot of the non-golf purchases of golf carts are for this reason. More and more people realise that golf carts are a very convenient way to transport items or people within a closed property. University campuses are a great example of this as they’re usually on sprawling amounts of land. Since so much of it is pedestrian only for students to walk to class, you can’t always drive quickly from one building to another. To get essential people from one building to another quickly, or to carry orientation materials from the admissions office to the student centre many universities use golf carts. Even retirement communities are making use of golf carts. Golf carts make it much easier for older people to get around without putting too much wear and tear on their bodies. The smaller size of a golf cart can be a great advantage. There are lots of places your car can’t access just because of its size; it’s either too wide or too heavy. Golf carts, on the other hand, can easily access narrow and off-road spaces. Better access is excellent for workplaces like we mentioned above, but it can also come in handy if you want to go camping or on a fishing trip. Golf carts are extremely customizable, so as long as you fit your cart with the right tires and lift, you’ll be able to take it wherever you want to go. Without a dedicated road, it’s hard to imagine driving your car right to the edge of a lake. Smaller golf carts can manage that trip without a problem. In a similar note, people are starting to use golf carts more often for hunting. Yep, you read that right. Golf and hunting seem like different activities, but golf carts come in handy for hunters. They’re quiet to drive, so you don’t have to worry about accidentally scaring off any prey. They fit into those small spaces that cars can’t, with enough cargo space to still bring the tools you need. Plus, you can even customise it with camouflage paint so that it doesn’t stand out amongst the trees. Instead of spending a lot of money on an off-roader, hunters are starting to customise golf carts to turn them into their dream hunting buggy. Finally, the best part about buying a golf cart — it’s affordable. Affordability is a prime reason to purchase a golf cart. Especially since so many transportation options are expensive. You can buy a used golf cart for as low as $3000, while new ones start as low as $6000 depending on the model and customisations. That’s a fraction of the price of a used car. Plus, since you can use it anywhere, it’s likely going to be a good purchase for you. Depending on where you live, you might even be able to drive your golf cart on the street. As golf carts surge in popularity, more government officials are taking notice and making them street legal. Bonus! Ready to get started? No matter why you want to buy a golf cart — even if it is to play golf — you can find the cart that suits your needs. 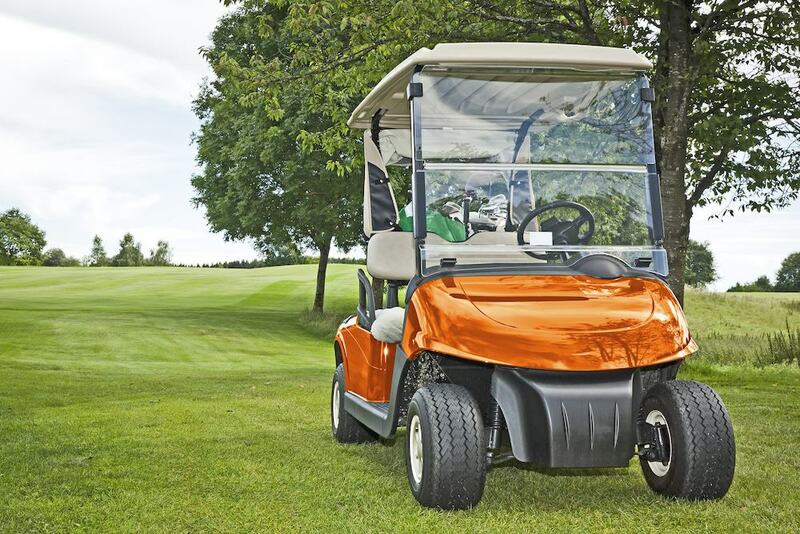 Our golf carts offer you the best value for your money, and we have a variety of models and colours. Plus, we offer worldwide shipping on all of our models. No matter where you are, we can help you to find what you need. Check out our golf carts to find your perfect fit today. You just dropped thousands of dollars on a golf cart. The only problem is that it’s boring. Sure, it does what it’s supposed to do. However, it doesn’t do much else. What are you supposed to do now? Did you waste thousands of dollars? Not necessarily. These days, there are all types of accessories for golf carts, some of which serve a functional purpose, and some of which are used solely for aesthetic reasons. These accessories can be used to gussy up your golf cart, making it much more fun and fulfilling. Are you interested in buying some of these accessories? Here are eight cool golf cart accessories you can purchase. The following accessories run the gamut from the practical to the cosmetic, to the functional, and beyond. Each one of them can go a long way in enhancing your golf cart and producing a more fulfilling ride. While you would love to drive your golf cart at night, it doesn’t have any lights. Fortunately, this can be easily changed. LED lights are one of the most popular golf cart accessories. These lights come in sets and can be attached to a variety of different components on your golf cart. Not only can they provide your cart with headlights, but with tail lights as well. LED lights are renowned for several different reasons. In addition to being exceptionally bright, they are also quite energy efficient. Not to mention, they come in a hard plastic material which is very difficult to break. If you want to take your golf cart to another level, you should equip it with LED lights. They will turn your golf cart into an entirely different beast. Are you tired of hauling a cooler around with you on your rides? If so, you should invest in a golf cart cooler. These coolers usually consist of heavy-duty materials which not only hold up through extreme wear and tear, but which provide terrific insulation throughout the day. They attach directly to the brackets on your golf cart, making them very easy to access. If you’re taking your cart out for a long day, these coolers can be handy. Most golf carts are equipped to seat two individuals at a time. However, they’re capable of holding far more than two people. How can you get more than two people on your golf cart? By installing a back-facing seat kit. Also known as rear flip seat kits, these cushioned seats can fold in and out, allowing for seating when it’s needed, and storage when it’s needed. Under these seats, there will be a platform installed upon which those that are sitting can place their feet. These seating kits are exceedingly simple to install, and can fundamentally transform your golf cart into another type of vehicle. The vast majority of golf carts do not come equipped with mirrors. Fortunately, you can install them yourself with general ease which makes your golf cart much safer to drive on public roads. Golf cart mirrors come in an array of options. However, the two most popular options include panel mirrors and convex mirrors. Panel mirrors contain several different mirrored panels, all of which face in different directions. These allow you to see anything that creeps up behind you. Convex mirrors are designed to detect anything that’s behind you. They leave absolutely no blind spots whatsoever. Have you ever wanted to take your golf cart out while it’s raining, but decided not to because you didn’t want to get it or yourself wet? If so, you will be happy to hear about the rain covers. There are a variety of different types of rain covers available for golf carts, some of which only work when the golf cart is parked, and some of which function while the cart is moving. Most golf carts don’t have windshields. Because of this, their drivers tend to get hit with everything from rain, to stones, to bugs, and more. Fortunately, it’s relatively easy to install a windshield on your golf cart. These windshields can be easily equipped to the front brackets on your cart, blocking any objects you meet while driving. Want to keep fresh on a warm day? Want to heat yourself on a cold day? If so, you need to consider adding some comfort accessories to your golf cart. Comfort accessories come in the way of misting machines and heaters, and they’re reasonably easy to attach to your golf cart. Whereas misting machines will typically mount to the front brackets of your cart, heaters will usually attach in the cup holder area of your cart. These machines get their power in a variety of different ways. While some connect to the electronic components of your golf car itself, others use mini propane tanks to which they’re attached. Tired of driving around in silence all of the time? Want to listen to some tunes while on your rides? With the installation of a sound system, this is a possibility! These days, there are sound systems which are specifically designed to accommodate golf carts. Mounting to various parts of golf carts, they play everything from MP3s to the radio, to CDs, and more. Golf cart sound systems come at all different quality and price levels. Whether you’re looking to spend $100 or $1,000, there will be a sound system that accommodates your budget. Looking for More Information on Golf Carts? Now that you’ve taken a look at some cool golf cart accessories, maybe you’re on the search for more information about golf carts? If so, you’re in the right place. All Electric Vehicles has all of the information you could ever need. Whether you’re wondering how to change a golf cart tire, how to maintain a golf cart, or otherwise, we’ve got you covered. Take a look at our other articles for more about all-electric vehicles. By the end of December 2016, people played more than 14.8 million rounds of golf in Australia. That’s an increase of 300,000 rounds, or 2.1% compared to the previous year which also means that the number of golf buggies could be on the rise. Today, people use golf carts for more than golf. The great golf vehicle has become a hit for various other venues and events. But, while these carts are great for small journeys, can we use them on the road as we would any other vehicle? Read this article to find out if your golf buggy is street legal. We’ll also tell you about some of the most common uses for these types of vehicles. What Defines a Road Worthy Vehicle? According to the Motor Vehicle Standards Act 1989, a roadworthy vehicle is one made to transport people. It can also transport animals and goods on public roads. Another type of roadworthy vehicle is a road trailer. These are without motor power but attach to motor vehicles. They also have their wheels. Simply put, for a vehicle to be road safe it must not endanger anyone or anything. So, where does this leave golf carts? After all, they have a motor, and they can transport both people and goods. Additionally, golf carts don’t enclose the passengers. And, they don’t have doors. Instead, people jump in and out. They also don’t go as fast as cars, buses, and other vehicles you’d see on the road. The construction of golf carts is not suitable for the majority of road uses. If someone were to drive one on the street, they would present serious safety risks. Many golf carts don’t have seatbelts, an accessory required by law. Additionally, a standard golf buggy can only reach a certain speed. With this in mind, driving one on a busy road could lead to traffic jams which can lead to agitation from other drivers, thus causing accidents. And, these accidents could affect both other drivers and pedestrians. While these conditions apply to most golf courses, it’s essential you follow the golf course rules and regulations. If you chose to travel on other roads than the ones listed above, you could face criminal charges. Can You Drive Your Buggy in Other Places Besides the Golf Course? You can also use a golf buggy for more unconventional uses. Some people use them for ground maintenance in private properties. Others use them to offer laundry services in residences. With the right permissions, you may also be able to cross roads if they are the only way to access separate parts of the same compound or business. You can also drive implements like graders and any other vehicle that seats 12 or fewer people. Additionally, you must be 16 years old to operate under the supervision of a person with a full license. To drive without supervision, you must be 18 years old. While you may believe that your ability to drive a golf cart works under your driving license, there are other requirements. A golf cart isn’t suitable for purpose if it doesn’t have four wheels. It must also have a maximum speed of 25km an hour on level ground to avoid accidents. Additionally, for buggies that can seat more than two people, any extra seats have to be bench type seats. And, for those with no more than two seats, you cannot drive a mass of more than 350kg. You must also have high flotation tyres making them suitable for grass and turf. As you can see the key difference between a road-ready vehicle and a golf buggy is its safety features. That said, golf buggies also don’t have the same capacity and power as other cars. They don’t go as quickly, and they wouldn’t withstand a severe collision with another, larger vehicle. While you can’t use your golf buggy to get to and from work every day, there are occasions where a golf cart is suitable. Of course, you can use it on the golf course. But, you can also operate one on some private residences and commercial properties. In the meantime, are you considering buying a golf buggy? If so, why not check out our range at All Electric Vehicles? We offer everything from golf carts to golf cart accessories, so visit us today! A game of golf may be an odd place for such a revelation. But it all starts when you see just how far modern golf carts have come. Forget that simple golf cart your dad drove. These tricked-out golf carts ensure you’ll never see the game the same way again. Don’t believe us? Keep reading to discover the seven most tricked out golf carts of all time! Why Tricked Out Golf Carts? We’ve prepared a great list of some of the world’s most luxurious golf carts. However, it’s important to answer a simple question: what’s so special about these carts? It’s true that you don’t need a tricked out golf cart to play golf. However, these carts can transform your game in several surprising ways. Sometimes, it’s because of convenience. Things like solar or electric-powered carts mean you get to spend more time playing and less time fueling up. Other times, it’s becoming a status symbol. Golf is a social game; why not have the best ride out on the green? Without further adieu, here are our top seven choices for luxury carts. Sure it got its name from one of the most famous places in America. But this first golf cart helped redefine luxury all around the world. The design is modelled after a Bentley, featuring a pearl-coloured paint job that is just waiting to shimmer in the sun. And aside from the standard dashboard CD player and chrome tilt steering wheel, this model is brimming with options for customisation. Want hand-stitched leather seats? Or a model suited for six people? The Brooklyn can be custom-ordered however you want it. As luxurious as they are, most of the golf carts on here are still just golf carts. This next model, though, completely changes the nature of the game. And he’s not exaggerating, either. This vehicle can go as high as 3,000 feet in the air, and he can fly at speeds of fifty miles per hour. This vehicle isn’t available for public sale just yet, but that’s only a matter of time. In previous years, he redefined golf carts with a hover cart suitable for any terrain. Golf is a very relaxing game. After all, this is why people play it. But wouldn’t it be more fun if you could become a king or a queen for the entire game? The next golf cart on our list is appropriately titled The Royal Limo. And “limo” is accurate, as even the standard version of this cart can transport six people at one time. That luxurious feeling doesn’t end there, though. The hardtop and leather seats keep you cool and comfortable, while the CD player and billet rooms ensure that every ride is a ride in style. Most of the golf carts we have featured so far have an emphasis on functionality. While they may look cute, their first priority is how many people they can carry, the quality of the seats, and so on. However, the F5 Cart has a rather singular purpose. It’s here to make you look like a speeding superstar while you golf. This fashionable red ride is designed to look like a luxury sports car. And it can only seat one person at a time, but that helps it go that much faster (up to twenty-four miles per hour). And if you don’t like red, there are other custom colours available. Find the sporty ride that’s best for you. We’ve talked about speed, and we’ve talked about functionality. But what if you could have them all in a single cart? The Hummer 6 Pack Limo H3 has functionality, including seating to transport six people at once. And that 72 volt A/C drive lets this vehicle combine velocity and control, making you feel more in control than ever as you drive. Finally, you get everything that comes with the Hummer name. That means sturdy design, eye-catching colours, and a guaranteed smooth ride. As you know, “luxury” means different things to different people. Some like a golf cart that looks like the sports cars of yesteryear. Others, however, enjoy something more futuristic. And with the next cart, the future is here. The Hammacher Schlemmer solar-powered golf cart lets the sun do the heavy lifting, so you don’t have to buy fuel for your vehicle. How good is solar power? 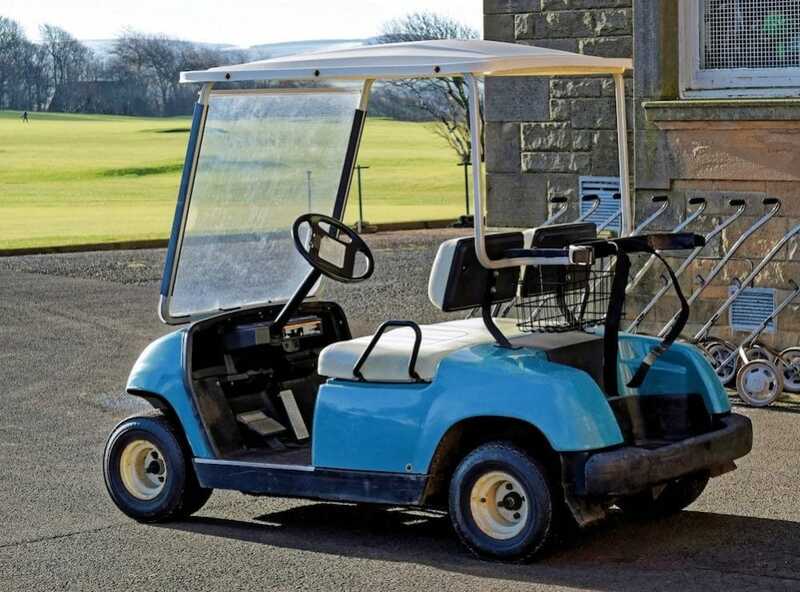 This cart can drive a whopping forty-nine miles before it needs charging again, allowing you to enjoy round after round of golf in peace and, yes, luxury. All of these carts have been luxurious and expensive. However, what cart would you choose if money was no option? Probably the Garia Edition Soleil de Minuit. What makes this golf cart so unique besides the price tag? Well, put simply, this is a golf cart that doesn’t necessarily know that it’s a golf cart. It has a gearbox designed by Ducati, meaning that you have the raw power and speed of one of the world’s most magnificent motorcycles under the hood. And the carbon fibre roof would be right at home on top of a BMW rather than on a golf cart. Finally, you get the wishbone front suspension that is popular with F1 car designers. And if being so attractive on the outside wasn’t enough, you can even get it with a refrigerator to keep things cold on the inside, too. Here at All Electric Vehicles, we think to have to fuel up your golf cart, and the car should be a thing of the past. If you’d like to own a piece of the future, come check out our golf carts today! Have you checked your club car tyres lately? Tyre neglect is one of the top 8 mistakes owners make with their cart. With the global golf cart market expected to reach $2,591.69 Million by 2023, that’s a lot of tyre neglect. Don’t let yourself fall into this trap. Keep reading to know how to change out your EZ go golf cart wheels and tyres. The first tool you need to change a tyre is a floor jack. Make sure that the jack can fit under the cart. Sometimes your club car will have come with a jack. If not, you can buy one from a repair shop or hardware store. You need chocks to prevent the vehicle from rolling. Wheel chocks are vital for your safety. To remove the lugs, you will need a socket wrench, racket, or tyre tool. Finally, you need a new tyre to replace the tire you are taking off. Park the golf cart on level ground. Once parked, turn the engine off and engage the parking brake. Have the bottom of the jack flat and stable on the ground. Slide it under a sturdy part of the frame. Many carts have a specific point as recommended by the manufacturer. Check your owner’s manual if you are unsure of where to place the jack. As you raise the jack, make sure the top is secure on the frame and when the cart comes off the ground, place bricks, wood, or chocks behind the wheels. Doing this prevents the cart from rolling and falling off the jack. If the cart comes down off the jack, it can be a dangerous situation. You only need to jack the cart up enough for the tire to be right above the ground. The more you jack it up, the more unstable and off balance it becomes. Remove the lug nuts that are holding the current tire on. Once you remove the nuts, slide the tyre off the lug studs. If you are not replacing the tyre immediately, lower the jack. The cart frame should sit level until you are ready to mount the new tyre, reducing the amount of stress placed on the frame. Today, golf cart tyres come in two versions. You will find some tyres already mounted on the wheel. If this is the kind of replacement tire you have, you can skip to the next step! Scroll down to mounting the new tyre. If this isn’t the type of tire you have, you’ll need to remove the old tyre from the rim. This task requires two tyre irons. Begin by releasing the air from the tyre with a valve tool. You are going to remove the valve from the casing. You need to break the bead. The bead refers to the edge of the tyre. When the tyre has the right amount of air pressure, the bead stays in the groove of the rim. Place one iron on the lip of the wheel. Place the other iron on the lip of the tyre. The two irons should be a couple of inches away from each other. Pull the tyre away from the rim, so the tyre edge goes over the rim. Work your way around the tyre lifting the tire’s lip over the edge of the rim. Repeat the process on the other side. Your first step is to wash the rim with soapy water. You want to remove any dirt and grease that is on the rim. Leave the rim wet and spray the tyre with some soapy water. Having both the rim and tyre wet with soapy water will make placing the new tyre easier. The soapy water acts as a lubricant between the rubber and metal. Start by placing the rim in the tyre. Tuck the tyre lip under the edge of the rim. Use the tire iron during this process if needed. Inflate your new tyre according to the manufacturer. Check the psi with a gauge and not with the pump. Often the pump’s gauge is off. Most club car wheels need to inflate to 20 psi. The amount of pressure required depends on the brand and type of tyre. Slide your new wheel onto the lug studs. Make sure the treads are facing the right direction. Manufacturers design the tread to work in a specific direction. Replace the nuts and tighten them with your hands. Lower the cart back onto the ground. Then use your wrench to tighten the lug nuts the rest of the way. Putting the wheel on the ground prevents it from spinning while tightening. Do not try to over tighten the wheel nuts. If you tighten them past firm, you risk stripping the lug nuts. Do not put any part of your body under the golf cart while you have the cart jacked up. If the cart were to come down, you could be seriously injured. Do not let children or adults sit or play in the cart while you change the tyre. The extra weight and movement can cause the cart to become off balanced. When replacing your club car tyres, start by having your cart on a flat and level surface. Turn off the engine and engage the parking brake. Jack up the tire that needs changing while following safety rules. Remove the nuts and take off the old tyre. If you have a tyre and wheel replacement, put it on and retighten the nuts. If not, change out the tyre and then remount it. Once the new tyre is on, lower the jack and finish tightening the nuts. Remember not to over-tighten as that will strip the nuts. Don’t just replace your tyres, upgrade your club car wheels today. Do you want to make it easy for you and your employees to get around inside your resort, theme park, zoo, or other commercial property? Then you should consider adding a few electric golf carts to it. Golf carts make it simple to get from point A to point B quickly and easily. They’re also straightforward to maintain compared to other forms of transportation, which is a big reason why they’ve become just as popular off the golf course as they are on it. There is some minor golf cart maintenance you’ll need to do once you add golf carts to your property, though. The maintenance will keep your golf carts up and running for a long time and will prevent you from having to do any major repairs. Here are nine golf cart maintenance tips you should follow at all times. The great thing about using electric golf carts is that you won’t have to worry about filling them up with gas; one less expense that you’ll have to deal with daily. But when you use electric golf carts, you do need to make sure they’re charged up at all times. Once a golf cart’s battery dies, you’ll have to put it away and let it charge up before you can start using it again. Therefore, it’s a good idea to get into the habit of charging your golf carts whenever they’re not in use. Doing this will ensure that you always have access to golf carts when you need them. In addition to charging your golf cart batteries up regularly, you also need to keep a close eye on the water levels in them. The lead plates in your batteries need to be completely submerged to work correctly. If you check the water levels in your batteries and they’re not submerged, you’ll need to add water to bring them back up. To do this, charge your batteries up all the way. Then, add distilled water, not tap water, directly to your batteries until the water levels sit about 1/2 inch above the lead plates in your batteries. Depending on how often you take your golf carts out and use them, you may have to do this every month. Don’t forget to do it or you could encounter severe problems with your batteries. While you’re checking the water levels in your batteries, go ahead and check the connections within your batteries as well. All the connections should be clean and tight. You shouldn’t have any corrosion or dirt coating the connections within your golf cart batteries. If you do, create a solution using water and baking soda and clean them. It’ll help you maintain proper connections within your batteries so that they charge correctly. Doing golf cart maintenance on your batteries is essential. But the batteries aren’t the only parts of golf carts about which you should be concerned. You also want to inspect your tyres and check the air pressure in them every week or so. If you notice that the air pressure is low, fill your tyres up with air right away. By taking this step, you’ll prevent your tyres from wearing out quicker than they should. You’ll also make your golf carts ride a lot smoother. Most people don’t drive golf carts very fast. As a result, the brakes on golf carts won’t wear out as quickly as the brakes on other vehicles. But you should still make it a point to inspect your brakes at least once every year. Your brake pads, drums, and cables all need to be inspected and potentially even adjusted to keep them working correctly. If you don’t know how to do this yourself, bring your golf cart to a place that can handle maintaining your brakes for you. Have you noticed that your golf cart appears to be leaking oil? It could be the rear differential giving you problems. If you ever see oil on the ground near one of your golf carts, climb underneath of it and check to see if there is oil built up on the rear differential. An oil leak could be a sign of trouble. You should have oil leaks looked at right away to avoid sustaining any severe damage to your golf carts. Lots of companies use golf carts to transport items around on their properties. Whether you run a big resort or own a zoo, you might utilise golf carts for this purpose. As part of your golf cart maintenance, check to see how much weight golf carts can hold and avoid loading them up with too much stuff. Lessening the load will reduce the strain you put on your golf carts’ various parts. Make sure your employees load items up on golf carts properly as well. Securing the load will keep your employees safe while protecting your golf carts at the same time. No matter how much of an emphasis you put on golf cart maintenance, there are going to be certain things you forget to check on golf carts. There are also going to be larger service jobs that you don’t have the time to tackle on your own. Schedule professional service on your golf carts once every 12 months. Having your golf cart serviced by a professional will allow you to address any issues with your golf carts that you might not catch. If, at any point, you’re driving a golf cart and there seems to be a problem with it, put it in your garage immediately and stop using it. 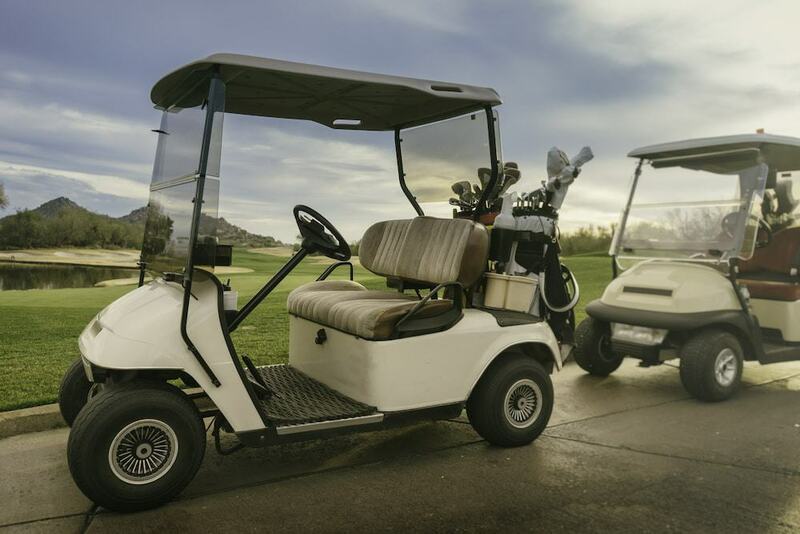 Outside of the fact that you could do further damage to your golf cart, you could also put yourself, your employees, and others at risk if you continue to drive a damaged golf cart around. When appropriately maintained, golf carts won’t need replacing for a long time. You can get more life out of your golf carts by making golf cart maintenance a part of your regular operation. If you do need new golf carts, make sure you invest in the best golf carts money can buy. There are also plenty of golf cart accessories that you can purchase to go along with them. Read our blog to learn more caring for your golf carts. You don’t need to be a golfer to appreciate the beauty of the golf cart. Small, quiet and convenient, who wouldn’t want to own one? There are many more exciting and practical uses for these little carts. Whether for personal use or commercial, the golf cart is useful as a utility vehicle in so many ways. It’s functional, inexpensive to operate and has so many applications. If you think golf when you hear golf cart, we’re going to show you why it’s so much more than that. Here are just a few examples. See if any of these ideas will work for you. Warehouses are busier than ever, what with the increase in online shopping. It’s a challenge to keep up with stock, loading it and unloading, filling orders, shipping the orders and moving the inventory around. How easy to zip between the shelving to find the items you need for your order. Besides being quiet, it is electric and has no harmful emissions. Clean air is an essential factor when a lot of people work in a closed space. These carts can hold a lot of merchandise and easily transport it across the warehouse floor. Whereas with the forklift the operator needs an exclusive license, a golf cart can be used by anyone who can drive. Get out to the middle of the field to check on your livestock, move tools and equipment around, and pass through smaller spaces with less trouble than your truck or tractor. These golf carts have the power to tow a small cart behind them, so gardeners can easily get around and take all their tools and equipment with them. Easily pull a lawn mower, bags of soil and plants, all the tools they need and can also pick up any debris and bring it back. Laundry can be easily transported around the grounds to get it all washed at the same time. The crew can work around the clock, as the carts are extremely quiet. This is an excellent way for people to move about the grounds, get to the airport, out to the golf course or other attractions, or to the central area where city transportation will collect them. While not safe for the highways, people can lease the carts for their pleasure and see the local town and other sights. It’s the perfect way to get around, stop for lunch, and take in the scene at a nice relaxed pace. It’s the perfect way to move people around the grounds. The performers may need to get to the stage or back to their bus, so what better way to avoid the crowds and still make it through a crowded, tight space. The need for security at these events is essential, and the need for them to react and get to the scene is just as important. The use of the golf cart means they can get right into the centre of the action when needed. When you have large groups of people together partying hard under the hot sun, someone is going to go down. What easier way for the emergency team to get around the crowd, get in and administer help or get the person out to where they can receive further treatment. When there are lineups for the vendor’s carts that seem to be snaking along forever, why not let the vendors come to the people. They can take coolers full of cold drinks, hats, sunglasses, and other items food right to the crowd. They are also great for going back and forth for more supplies. If the vendor has a cart where he is cooking, he may need to replenish several times. Rather than walk or try to store it in his limited spaces, he can pop out to get more. You can lease a golf cart out for a day or a few days for any need or special event you have coming up. An outdoor wedding may cover a lot of ground. You can rent the carts for the caters to set up their tables or the bar. You can use them to transport the chairs, stage or other needed items, and you can use it to get people to the event. Some people may have trouble walking, and this is the perfect way to get them safely to their seats. The bridal party don’t want to walk through a field to get there and ruin the dresses and shoes. A college campus has limited space for technical, maintenance and emergency vehicles to get through. The golf cart is perfect for all of these uses. With a small trailer hooked to the back, supplies can be moved effortlessly through the grounds. You can also use a golf cart utility for interoffice deliveries, for books, files and any other information or documents that can’t be delivered electronically. From the cafeteria to libraries and records management to first aid, there is no limit on what they can do. When the golf cart is not in use, it can be charging. There are no harmful fumes released, the carts are inexpensive to buy, even cheaper when you buy used and they are easy to maintain and repair. They are easy to drive, don’t go too fast and are a sturdy vehicle built to work and endure. Golf Carts are far less expensive than a regular car and eco-friendly to use. Whether you need it for a day, a week or you want it for your day to day activities; you can’t go wrong. Take one out for a test drive today and see how it feels. If you need more information to convince yourself, please continue reading here. Remember being a kid and asking your dad to drive his golf cart all the time? Was this how you got around the neighbourhood to see all of your friends during the summer? Golf carts seem like so much fun when you’re young; as you get older, though, you realise they’re not a toy. It takes a lot of time and attention to maintain the quality of a golf cart, not to mention to find the right one in the first place. You will find this to be especially true if you have a whole fleet of golf carts to buy instead of just one or two. As you’re shopping for the ideal model for your country club or resort, make sure you pay attention to the tyres. Here’s everything you need to know about buying and maintaining golf cart tyres. As nice as it is to have a golf cart that can seat multiple people or go a little faster than the norm, it’s even better to have one with good tyres. The right tyres ensure all of your golf carts perform their absolute best no matter how many people are on board or how fast you go. The kind of tyres you get determines the terrain a golf cart can handle and how well it lasts over time. To ensure you pick the best ones, always consider the following three things. Turf and street tyres are the ideal choice for casual golf cart uses. They’re great for going on the golf course with because they won’t mess up the grass as people come and go. These are still durable enough for sidewalks and paved streets. For those who foresee their golf carts going on dirt roads or otherwise uneven areas, you need something a little stronger. Consider getting tyres made with an off-road tread instead. Such patterns are more pronounced – they’re meant to dig into surfaces like deep dirt and mud. These tires make uneven surfaces a breeze to navigate, but they may feel a little bumpy on a paved road. The final kind of tire tread available for golf carts is all-terrain tread. These are ideal for use on a golf course as well as on a dirt road. The tyres do well on smooth terrain without feeling bumpy, yet they can dig into the ground when necessary. Once you’ve identified the right tread pattern to fit your needs, you have to think about the size of the tyres you need. Standard tyre sizes measure 18 x 8.50-8. They have an 18-inch diameter and an internal width of 8.50 inches, perfect to fit on an 8-inch wheel. Sometimes, though, you’ll come across larger or smaller options. Note, these will require you to invest in other accessories for the golf cart to look and feel just right. Large wheels need a lift to go onto the frame, while smaller wheels may need to be closer to the ground. The size of the tyres makes you think about how far off the ground you are. But, you also have to consider how far you want the wheel to be from the frame of the cart. Referred to as the offset, which is usually centred or negative. A centred offset means the tire sits right on the middle of the wheel. It’s the standard fit for tyres that meet the measurements mentioned above. Larger wheels tend to have a negative offset, though; they’re further away from the frame to keep from rubbing together while turning. The wheel offset creates the best possible function while the wheel finish is all about aesthetics. 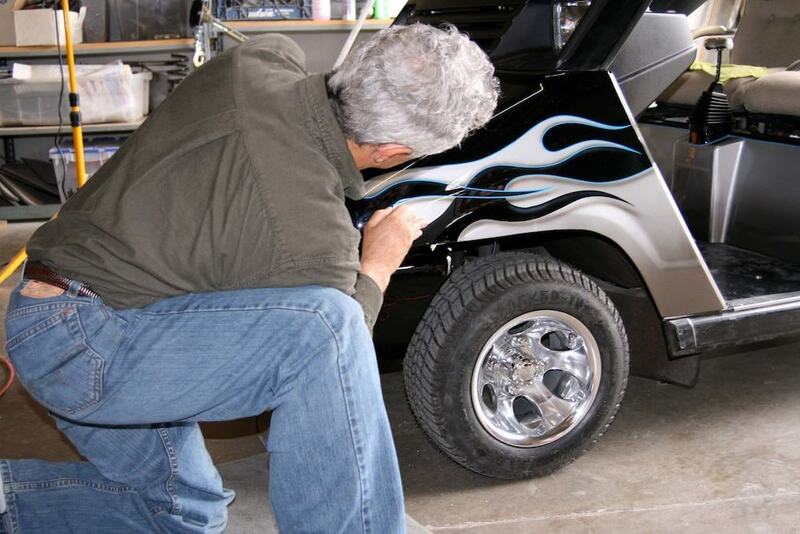 Your choice of the rim is a great finishing touch to any golf cart tyre you choose. Wheel finishes are available in chrome, polished, or machined design. It’s one thing to find the right tyres for your golf cart(s), and a different story to make them last. Thankfully, tire maintenance isn’t too complicated when you know what you’re doing. As when driving a car, you have to make sure all four wheels of your golf cart are aligned. If one of them is not pointing in the same direction as the others, it can make the whole ride a little uneasy and more challenging to steer. You can check alignment with a measuring tape. Measure the distance of the inside of the two front tyres from one another. Then, do the same for the back tyres and compare the measurements. You want to have a slight difference between the measurements of the front and the back. If there is too much variation, or if the tyres need to be adjusted in/out, you have a bit of work to do. Fix the issue by jacking the golf cart and fixing the tie rods until you’ve reached the ideal measurements. Another maintenance tip – and arguably the easier of the two – is to check the tyre pressure. Check the tyre pressure is a simple task you can do by pressing your fingers on each tyre. There should be a bit of giving but not too much to cause concern. If there isn’t enough tire pressure, though, a quick pump of air should do the trick to keep each golf cart on the road. Wondering which kind of golf cart is best for your theme park staff? Have you found the perfect model, but want to make sure you get the tyres right? Not to worry, we can help you figure everything out from the golf cart frame to the golf cart tyres and all the awesome accessories available. Click here to start shopping.